If you’re shopping for a dependable vehicle that will suit your lifestyle and your budget, there’s a new Chrysler, Dodge, Jeep, Ram that will work for you. Whether you want a versatile SUV like the Jeep Wrangler, a rugged pickup truck like the RAM 1500, or a family-friendly minivan like the Chrysler Pacifica, you’re sure to find the right vehicle at the right price. Make sure to check out our current new vehicle specials to get the best deal possible. Once you’re ready to take your favorite CDJR model for a spin, visit Burtness Chrysler Dodge Jeep Ram in Whitewater!. By submitting this form you agree to be contacted by a Burtness Chrysler Dodge Jeep Ram staff member. New vehicle pricing includes all offers and incentives. Tax, Title and Tags not included in vehicle prices shown and must be paid by the purchaser. While great effort is made to ensure the accuracy of the information on this site, errors do occur so please verify information with a customer service rep. This is easily done by calling us at 262-214-0867 or by visiting us at the dealership. Why Choose a New CDJR Vehicle? Whether you’re searching for a new work truck, a tire-scorching muscle car, or a capable off-roader, you’ll find the right vehicle to suit your needs in the new CDJR line-up. The RAM 1500 comes with many class-exclusive features such as the RamBox Cargo Management System, 10-square-foot dual-pane panoramic sunroof, and 12-inch touchscreen. The new Dodge Challenger performance muscle car is offered with a choice of 4 powerful engines, including the supercharged 6.2L HEMI SRT Hellcat V8. The Jeep Wrangler is the perfect choice for off-road adventures at Apple Valley Farms Off-Road Park. Ready to explore even more CDJR models like the spacious and capable Jeep Grand Cherokee? 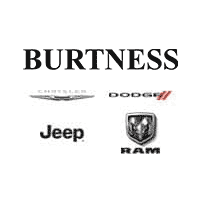 Contact Burtness Chrysler Dodge Jeep Ram today! Whether you lease or finance, we’re ready to help you drive off the lot in the new car, truck, SUV, or minivan that’s right for you.